BRISTOL BLUES HOST FAMILY TODAY! Each season, young men from the Bristol Blues Baseball Club will arrive in Bristol from their hometowns around the country. The Host Family Program has helped these young men to be able to play in Bristol for the summer by providing them with a welcoming home. From the end of May through the beginning of August, these ball players will continue to hone their baseball skills playing 56 regular season games in the Futures Collegiate Baseball League working toward their goal of a professional baseball career. Throughout the history of baseball, Host Family Programs have been a vital part of the success for nearly every team, both on and off the field. 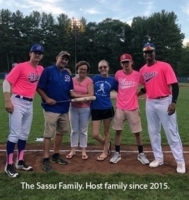 For many host families, their player becomes more than a guest – they become part of the family. In doing so, it allows these young men to stay grounded and comfortable in an unfamiliar city. 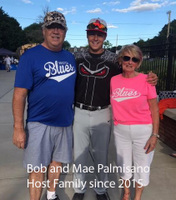 become a Bristol Blues host family today! What Do Our Players Need? * A clean private bedroom, access to a bathroom and a laundry room (they’ll need to use showers and do laundry occasionally). drinks and snacks. You'll have contact with your player and his family prior to his arrival to know his preferences. you will not be responsible to provide them transportation. The team is responsible for this. * And of course, a family to cheer them on. throughout the season, your player leaves the program for any reason. * Season passes for the entire family (must live in the household). and special gift presentation. Date to be announced. * Stipend - a small stipend, to help cover the cost of hosting will be provided mid-season. * Host Family Dugout Night - Enjoy the game with other host families from the dugout suite. Includes one (1) food and one (1) beverage per person. Date to be announced. 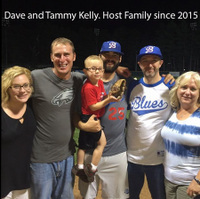 * Host Family Tee Shirts - Sport an official Blues Host Family Tee. * Receive All Giveaways even if you are not at the game. back of the stat sheets for home games. Thank you for supporting the Bristol Blues Baseball Club! !